Tennessee recently recognized living wills (as stated in TN 68-3-501) in addition to medical powers of attorney. These directives extend your basic right to make your own healthcare decisions. With a medical power of attorney, you can appoint someone to make healthcare decisions for you if you become incompetent. This can include almost any decision you would normally have the right to make. For example, you can appoint the agent to refuse or consent to any medical treatment, procedure, or surgery to affect any condition, and the agent may hire or discharge medical personnel. By choosing an agent who understands your values and discussing your goals thoroughly with him or her, you will be in a better position with someone to advocate on your behalf when you cannot. 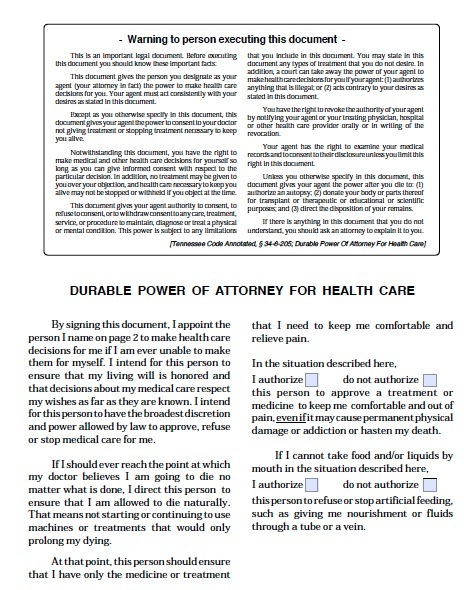 In Tennessee, living wills are now called “Advance Care Plans.” These documents instruct doctors as to how you want to be treated if you become terminally ill or permanently unconscious. Thus, you may indicate that in either condition you do not wish to receive life-supporting treatments like dialysis, mechanical respiration, CPR, or artificial nourishment.